Autodesk won't generate a license that will enable me to use both Maya 2017 and Softimage at the same time as stated in the product description. I don't have an on going subscription but my license are permanent. 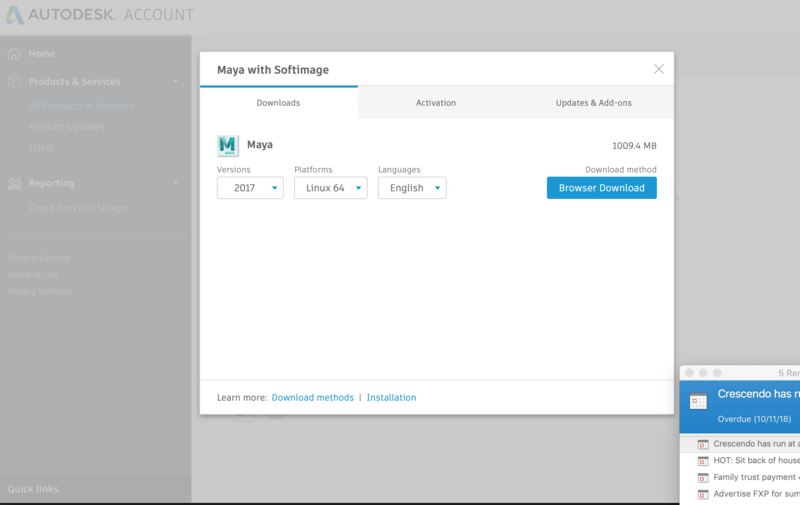 Could anyone in the USA help with a 'false advertising' complaint to the Federal Trade Commission as the product states 'Maya with Softimage' but they won't give a single license to use both at the same time and try to upsell new subscriptions. I'm in New Zealand. Has pushed me towards contributing to the blender fund. Isn't cgtalk.com a ghost town since they killed Softimage and made subscriptions! Have people moved onto facebook and twitter, I'm not on there, or have they just given up in disgust at Autodesk. The irony is that they themselves have ruined their own ME business but instead of becoming more pleasant they are pissed and have gotten more mean and horrible. Last edited by Nolan on 05 Jan 2019, 23:44, edited 1 time in total. Maurice Patel said that you can use both. You can sue them in New Zealand i think. They should both function the same, and if I remember right they were advertised to be "1 click interoperable" which only works when both are running. It looks like it would be 15 minutes of work for someone. Just for your information I posted the same post on cgtalk incorrectly in the news section probably because I posted in News here. It was closed correctly. So I posted again in the General section. But now it seems to have disappear. I hope my comment didn't offend when I said cgalk was a ghost town. Its my go to for dialogue. Thing is that they may stop me from posting about my brand new software which is very useful in a text based CG pipeline especially. And it stops any attempt to spread the word about suing Autodesk for false advertising. In my opinion. "The only way you can have access to an earlier version is by having an active subscription, or purchasing the license under a subscription." But the license say 2017 "Maya with Softimage". Its a permanent license and my FINAL version as it were . I have tried periodically over months but just give up each time. It's a pain because to try the different serials & products keys I have to reinstall each time. If they can fix it in 15 minutes. Why don't they. I 'll contact them again. "Regarding your case, to check it further, would you please send the current License File ? It doesn't seem like it includes SoftImange 2015 but I need to check the license file. If you have another serial number please provide with it and we can totally re-create the file" - My latest license 2017 "Maya with Softimage" doesn't include any words that mention softimage,xsi. Did you bail at that version? Does yours? With the amazing analytics you'd think they'd would be more helpful. When asked "How can my license be for “Maya with Softimage 2017” be “Permanent” if I can’t even get a license which works for both the latest versions? I’m very disappointed! Please remedy this situation.". Why wasn't I told I could obtain such a license? It is very difficult situation if I have to keep swapping licenses to use both products. When Maya 2017 & Softimage came out I may have not got a license for a while. Is that the problem somehow? It's probably just me somehow because I kept leaving it for months at a time? Last edited by Nolan on 05 Jan 2019, 23:45, edited 1 time in total. Come to think of it, I was never able to download 2017 Softimage from Autodesk and had to use https://knowledge.autodesk.com/search-r ... ack-2.html . They have never given me a license with the text Softimage or XSI in for 2017. I did contact them and it's been a long 15 minutes. "We do apologize for the inconveniences that you may faced. As we already explained you Maya with Softimage 2017 is registered and it doesn't have an active subscription.For this reason we're unable to provide you with the requested access for the Autodesk Maya with Softimage 2015, therefore when we generate a license file the system will only let us generate the 2017 version." - "faced" alright. Is it payback in my opinion? I also wrote a post on CGTalk about how so many ex Softimage developers that Autodesk could let users pay for for it to be developed maybe on github by those ex developers but my idea wasn't to open source it. They would still charge for it. I can't find a way to search the new CGTalk for my old posts and I can't find it in the https://web.archive.org. And hans't CGTalk changed to new software anyway, I suppose it was bad timing for them as they could have decided to cancel it already in my opinion. I wonder what CGTalks reason is for deleting my post from the General Discussions forum? Last edited by Nolan on 23 Nov 2018, 08:10, edited 1 time in total. Last edited by Nolan on 05 Jan 2019, 23:46, edited 1 time in total. Autodesk once sent me a communication asking for information about myself. Can't remember if it was an email or snail mail. I never replied. "What is the latest version of Softimage called? And how do I download it? I can’t find the download." "Support Case (14800064) is now closed.Support Case (14800064) is now closed." "You can find the download link in your Autodesk Account. ........."
I assume am able to download it now. You understood my desire for Maya 2017 with Softimage surely. They couldn't seem to understand it. I suppose technically I would not have been able to use Softimage anymore because I could't download the latest version. So only had the old 2015 SP 2 version that I couldn't use as I wasn't on an active subscription which allows you to use older versions. Unless its bundled in the Maya 17 Package I still can't find it. Is your Softimage, the one they won't give a name, listed in here? Autodesk keep closing the case. Can anyone tell me if their Autodesk page is the same as the screenshot above? Did you use https://knowledge.autodesk.com/search-r ... ack-2.html to obtain your final copy or is it in the Products page? Is the final of Softimage called 2015 SP2? if you really have bought "Softimage with Maya" (and not upgraded to a collection something else), then Softimage 2017 with Maya is product key 977I1. I cannot recall if the license they generate just works or requires manual intervention to add some Softimage 2015 license token to it. It's not a Maya 2017 license or two separate produce licenses, it's specifically a "Softimage with Maya" 2017 license that both products with run off. The last build of Softimage is 2015 SP2 and it's definitely not included in any Maya installer. It's a separate installer. You can just use google to find the download link for that.